Overall Impression: A very nice hotel with clean rooms, satisfying dining options, and courteous staff. The Sheraton Grand Krakow Hotel is an upscale hotel in downtown Krakow, Poland. 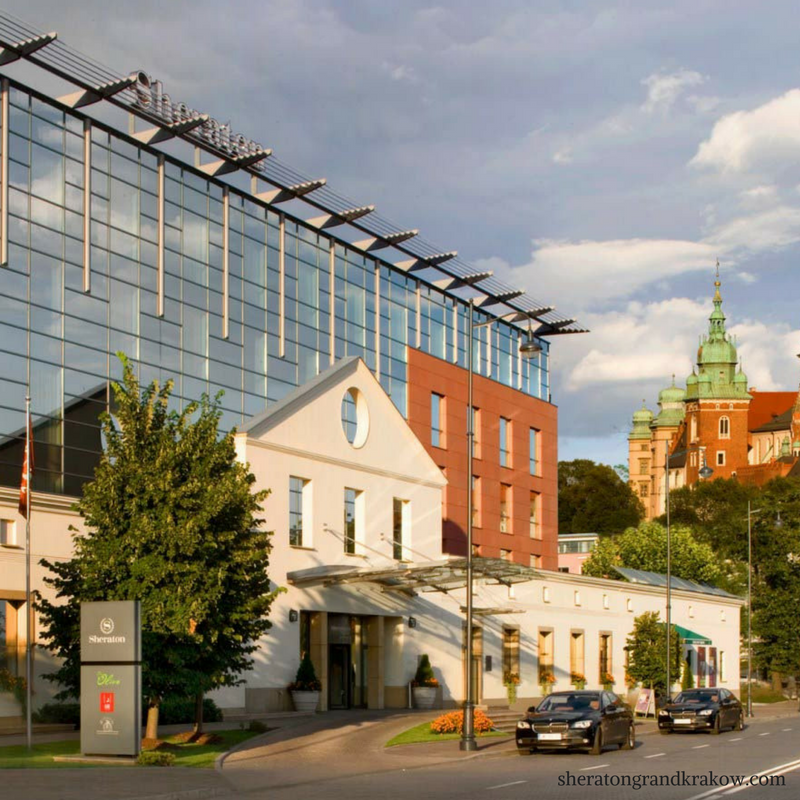 Located on the banks of the Wisla River, this hotel is in an ideal tourist location as it is only a ten minute walk from Krakow’s Main Square and a five-minute walk from Wawel Castle. The hotel has an atrium style building, with a central, large open area with rooms and hallways surrounding it. The hotel offers over 200 suites and rooms which have been recently renovated with modern decor. The view of the atrium from above. 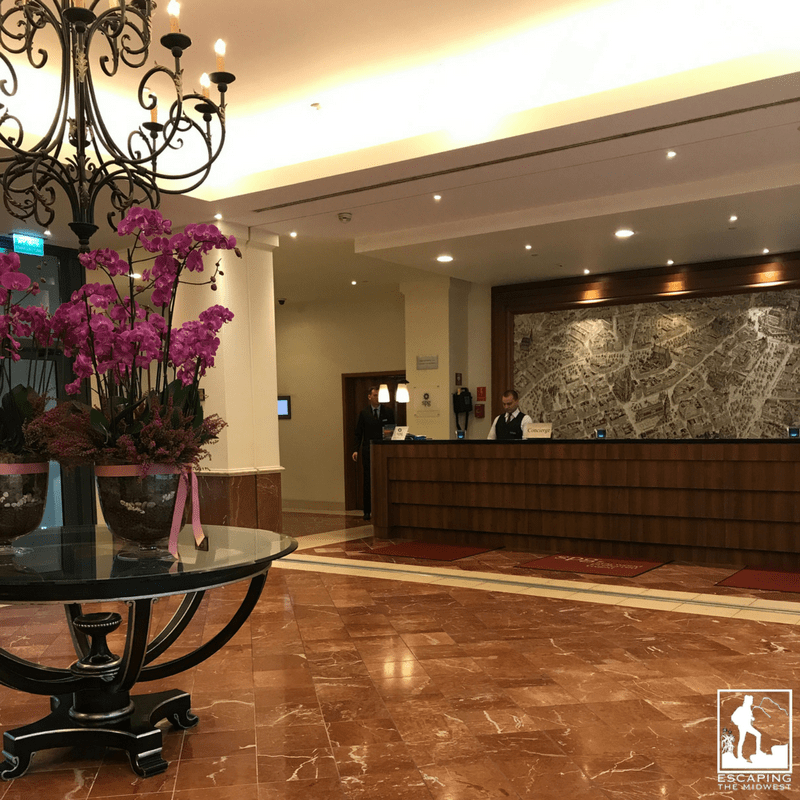 My initial thoughts about the hotel were very positive: the interior was bright, spacious, and clean; the staff was friendly and also spoke English; and the design and decor of the building was lovely. There was a polite doorman who greeted all visitors and helped with doors and luggage. He was very happy to help you grab a taxi or offer an umbrella on rainy days. The front desk staff was very helpful and there was never a long line for service. I was delighted that so much of the staff spoke some English, not just at the front desk, but throughout the hotel. I did notice quite a few American tourists staying within the Sheraton Grand Krakow. The elevators at the hotel were great. They were always available and open when on the first floor, which was very convenient. You do need to use your key card to use the elevators and only one elevator will take you to the lower level which has the hotel’s workout facilities and parking. There is a small desk in the room as well as a flat screen TV. On the television was a very bright blue clock displaying the time. It was rather annoying at night so I covered up the light. You can connect your mobile devices to the television by bluetooth and international tv channels are also available. There are two USB outlets on each side of the bed as well. The bed was a little soft for my preference, but overall I had a satisfactory stay in the room. The view from my standard deluxe room. In the hall, there are two closets with hangers and one contains an iron and ironing board. Within the closet, you can also find a safe for your valuables. On the counter between the two closets, there is a water kettle with a small assortment of teas and coffee. Underneath the counter was a small fridge and mini bar. There was a display of alcoholic and non-alcoholic drinks, as well as snacks for purchase. The small refrigerator was not a pressure-sensitive mini-bar, so you could move the drinks out and around to make room for your own soft drinks or leftovers. An electric water kettle and complimentary coffee and teas are provided. Inside the closet, you’ll find a safe, iron, ironing board and hair dryer. The bathroom in my room was clean and a good size. However, I wish there had been a bit more counter space around the sink. There is additional counter space, but it’s outside the bathroom where the tea kettle is. Keep an eye on the water spray when you shower; since there is only a small glass partition that unfolds, a lot of water can get on the tile floor, so be careful! As you can see with the results below, the wifi at the Sheraton Grand Krakow Hotel was pretty good. If you are an SPG member (as I am), you receive free wifi at all hotels in the Starwood Hotel family (Sheraton, Marriott, Ritz-Carlton, Westin, etc.) Otherwise, high-speed wifi is free in public areas, but costs 45 zloty, or around $13 USD each day. Speed Test for the Sheraton Grand Krakow Hotel during my stay. In the morning, you can dine on an international breakfast buffet at The Olive (for around $28 USD per person), the restaurant in the main atrium. A wide variety of pastries, fruit, meat, cheese, and cereals are available, as well as made to order eggs/omelettes and a small selection of hot breakfast items. The Olive also serves lunch during the weekdays and dinner seven days a week. For more information on the Olive Restaurant, as well as their hours, follow this link. Also in the glass-roofed atrium is the Qube Vodka Bar and Cafe. Here you can get amazingly delicious Polish vodka, craft beer, wine, and tapas. Comfy chairs, plush sofas, and a piano can be found in this lounge. There is also a vodka bar and lounge next to the atrium restaurant for a more relaxed afternoon or evening atmosphere. Qube is open everyday from 8am until 1am. Someplace Else is an American style sports bar that focuses on Tex-Mex cuisine. As a vegetarian, I found a few dishes here that were veggie friendly and/or served tofu. This restaurant is open for dinner 7 days a week and for lunch on weekends. There is also outside seating here during the warmer months. Click here for more information on Someplace Else, including their menu and hours. On the roof of the Sheraton Grand Krakow is the Roof Top Terrace & Lounge Bar, located on the 5th floor. As I was here in late September (when it was rainy, cold, and dark by dinner), the bar area and small seating area were enclosed in glass. It seems like it would be an absolutely beautiful place to visit and dine at when the weather is nice as you get views of Wawel Castle and the Wisla River. Dine on all types of wine and drinks, as well as food and desserts. I didn’t dine here but there are a few vegetarian items on the menu. Keep in mind, the Roof Top Terrace & Lounge Bar is closed during the winter. For more information on the rooftop bar, click here. The Roof Top Terrace & Lounge Bar was closed off to the outside, but there was ample seating. Other amenities include an indoor pool, sauna, and fitness center on the lower floor. I did not visit the pool and gym so I’m unable to review it. (Find info and photos on their website here.) There is also a 24 hour business center, dry cleaning service, a concierge, parking available (for a fee), and pets are allowed to stay here for no additional charge. You can find a small shop in the lobby, selling most amber jewelry, but there are a few essential items for sale here as well. 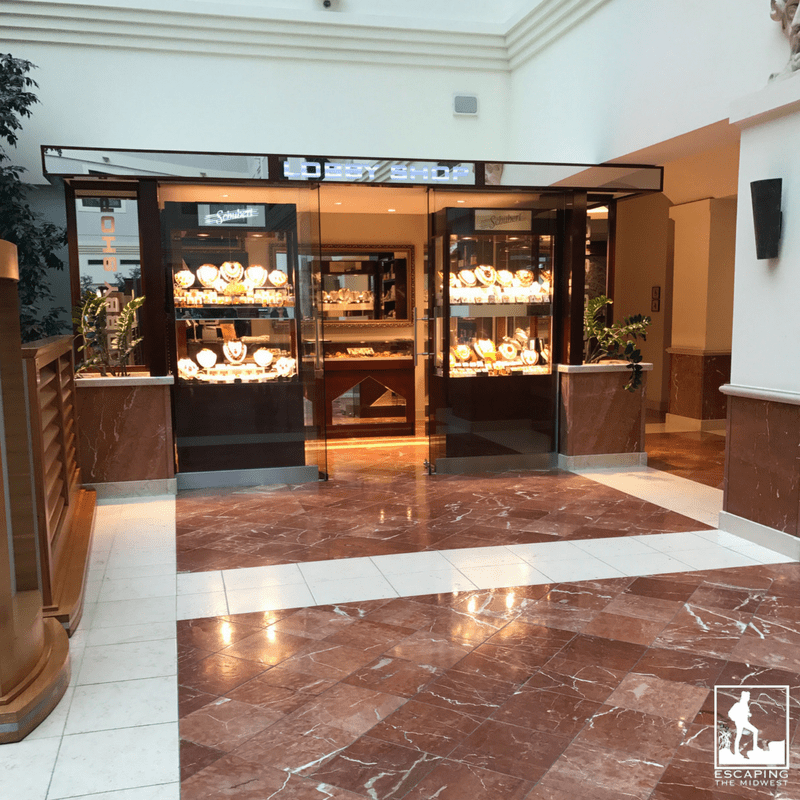 The lobby shop which sells mostly amber jewelry. 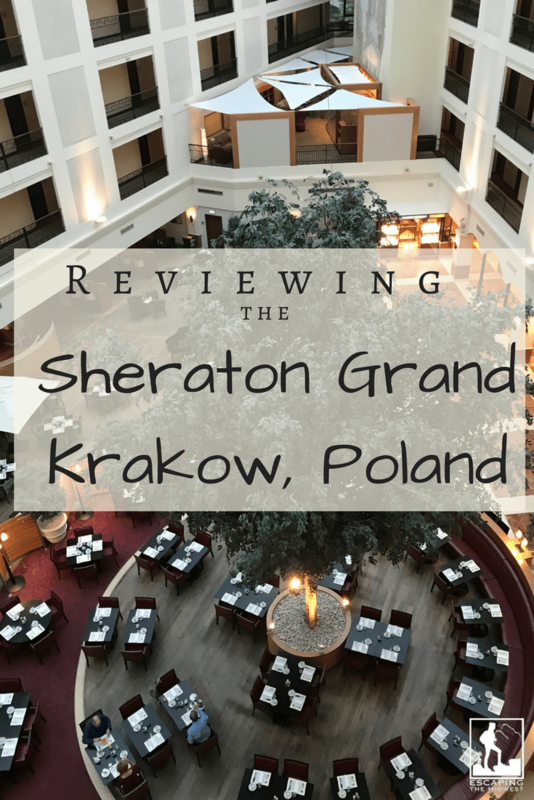 Overall, I was very pleased with my stay at the Sheraton Grand Krakow Hotel. I don’t recall having any problems with my stay. The staff was friendly, service was good, and my room was clean and inviting. 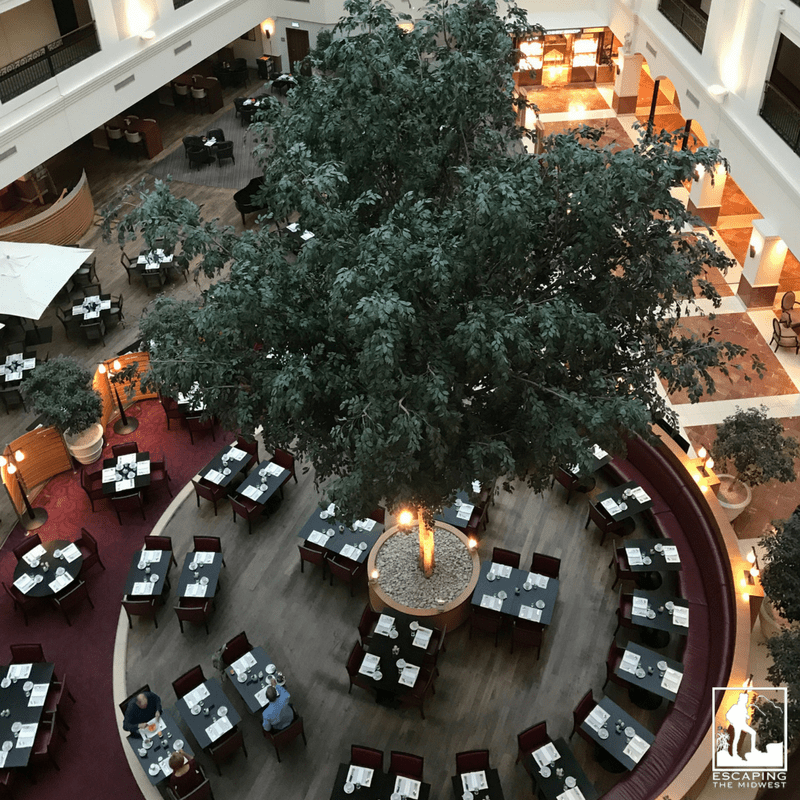 If you find yourself in Krakow, I highly recommend staying at the Sheraton Grand Krakow Hotel! 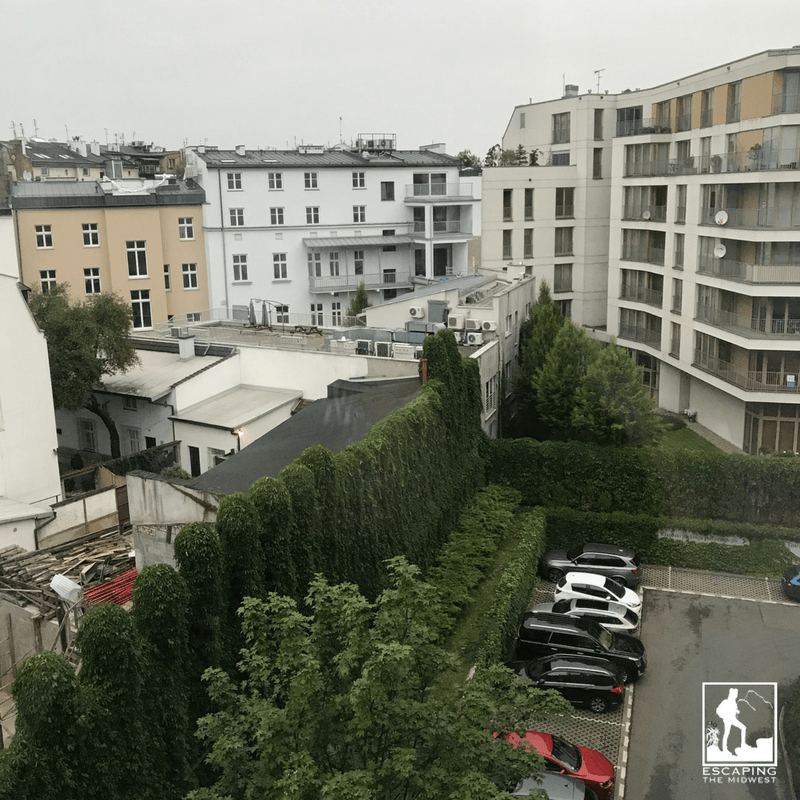 For more information on touring through Krakow, check out my other posts!